Peace Be Still. By He Qi. O LORD my rock and my redeemer. AMEN. You know Whanau, I feel lucky this morning, and its not because I won Lotto last night. As if preaching here, and being with you all this morning isn’t enough, when I looked in my lectionary last week to see what the readings were, I found the reading we have this morning is one of my favourites in the entire bible. Here we have Jesus and some of his disciples out in a boat on the Sea of Galilee. Mark tells us that they are on their way to the town of Gerasa, and while they are on their way, Jesus falls asleep. Whanau, that right there is why I love this reading. Here we have Jesus, the promised Messiah, the Son of God, and what is he doing? He is sleeping. In this moment, this brief instance we are given an insight into Jesus that we don’t often get, that is an insight into his humanity and indeed his human vulnerability. Here we are reminded of the human nature of God, the fact that God sent his son into the world for us. Not simply as conqueror, or some sort of super-human entity, but a fully human manifestation of God, what a beautiful thing. He got hungry, he got angry and he even got sleepy sometimes. Jesus experienced life just as we experience it and in that knowledge there is a sense of comfort for those of us who continue to struggle through life’s challenges, through life’s ups and downs. That comfort is the knowledge that Christ himself experienced these struggles, and continues to experience them with us. As our reading continues, we see Peter, perhaps hysterically, attempting to wake up Jesus. There is a huge wind on the water and the waves are pounding the boat, fearing that the boat will sink, Peter puts it to Jesus, “Do you care?! ?” So, in what seems like a dramatic shift, from a sleeping, fully human Jesus, we see a change to a wind and rain stopping Son of God. I think a lot of us here can relate to what must have been going through Peter’s mind at that very moment. Here he was, literally facing death as the boat was being swamped and where is Jesus, the Man who can make it all go away? He is sleeping! I remember in 2010, my older sister, the oldest in our family of 7 kids, was very sick. She was having seizures and blacking out all the time and the doctors didn’t quite know what was going on. She had MRI Scans, she had tests but still, they didn’t know why these things were happening. It wasn’t until mid 2010, after a series of CT Scans that they found a tumour in her brain that was growing just behind her ear. In that moment, at that time, it felt to me as though Jesus had fallen asleep, and my whanau and I were alone, facing the devastating news that my sister had Cancer. We all have moments like this, Whanau. Times where it can seem as if we are at it alone and we cannot see Christ or God in anything we are doing. When children are beaten and killed by their whanau, when loved ones pass away well before their time, when we look at the Newspaper and it seems as if there is war and suffering all around us, these are moments where we can all be forgiven for perhaps thinking that we are alone, and Christ has fallen asleep, unaware of the pain we are experiencing. 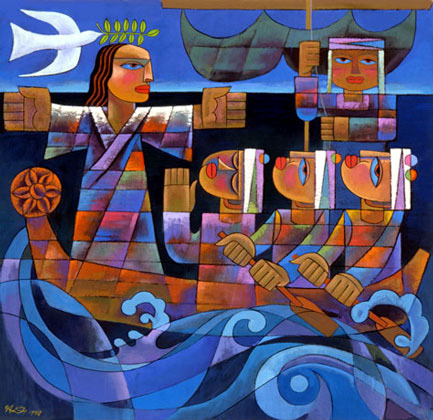 But whanau, in our reading is the remedy for this feeling, all along, Jesus was with the disciples in the boat, and every step of the way, Christ is with us. Christ’s response to Peter after having calmed the storm holds the answer for us, Christ said “Why are you afraid? Have you still no faith?” Faith, Whanau, the answer is faith. Of course this reading is all about faith, and faith, along with love and hope, is one of the most important aspects of our callings as Christians. This doesn’t mean that we are always 100% sure of ourselves or our lives; it doesn’t mean that we don’t have moments of doubt, it doesn’t mean that there won’t be times where we think Jesus, or even God has fallen asleep on us. Faith means that despite those times, we remain strengthened and empowered in our calling as Christians to love and to serve. Faith provides the foundation that allows us to live lives of service informed by love, and if we do it properly, faith means that our love becomes real and transforming not just for us, but for everyone around us. I believe that as humans, we are called to love. Nowadays, love is word that gets thrown around all the time, it seems we have almost gotten too familiar with it as a word that we no longer feel it as the deep and powerful emotion that it really is. We live in a world where the important thing in a marriage isn’t love, but your sexual orientation. We live in a world where we use love to explain the way we feel about food, we use it to explain how much we like a song or music, we even use it to say how much we like a pair of shoes or jeans or a stunning dress, as Christians, I believe that we are called to a much deeper love than that. The Lutheran theologian, Dietrich Bonheoffer wrote a lot on his ideas around grace, his main whakaaro was that we should avoid what he called ‘cheap grace’ and strive for ‘costly grace’ I think the same thing applies to love. It is easy for us to love those who we like, those who we are close to, but that sort of love is easy for us; it is a cheap love that costs us nothing. It is much harder to love those who no one loves, to stand with those who are being persecuted, the lost, the lonely, the outcast. When we refuse to ignore injustice, when we choose to speak out prophetically in love rather than remain silent, that is when we are exhibiting the love that all Christians are called to show. It isn’t an easy thing to do, but with the faith that Christ talks about in our reading this morning we are all the more ready to show that love when the time or situation demands it. Our Gospel reading this morning alerts us to issues of faith, it is a reality of the Christian life that there will inevitably be times where we question our faith, where even the most faithful among us will be tested, the thing we are reminded of in our reading this morning is that even when those moments come and it seems as if our faith is getting smaller and smaller, we must remember that Christ is with us, even if like in our reading this morning it seems as if he is sleeping, he is there nonetheless, and that knowledge alone is enough for even us to command the wind to cease and storm to stop. As a minister, a lot of people make assumptions about me, especially when they see me in a clerical shirt or ‘minister’s clothes.’ Some people think I must be really spiritual, while others take me for somewhat of a Moral Policeman. Some of those assumptions will be correct, while others will inevitably be wrong. This is one instance where I think people would be assuming me to take a certain stance on an issue, when in reality; I stand on the other side. Recent reports in the New Zealand Herald (you can find the report here) tell the story of Tuni Parata, a hard working, committed member of the staff at SkyCity in Auckland. Ms. Parata has made headlines because, in the words of her employers, she breached the uniform policies of her job. So was she wearing bright nail polish or did she dye her hair a bright colour? No, Ms. Parata was carrying a Bible in her pocket. As I said before, people would perhaps be expecting me to write in outrage at what has happened, but to be honest, I am not that outraged. I can only make an assessment on an issue based on what I know, and at the moment my knowledge on this issue is largely from the Herald report, and from that report, I don’t really see the issue. I accept that the response from SkyCity may have been over the top, I don’t think there was any need to issue her with a notice and use the rather stern language that was in the letter, but at the same time, I think SkyCity has a point, they have a policy on staff carrying things in their pockets and Ms. Parata breached that policy, Fair enough. I think where SkyCity went wrong was in the harshness of their response for what is, in the greater scheme of things a rather minor issue. It seems that a quiet word to Ms. Parata would have sufficed, instead SkyCity choose to go down a more formal route, a rather bad call in my opinion. While at first glance this issue seems to be quite a big deal, and I accept that this has no doubt placed undue anxiousness and stress on Ms. Parata and her family, it seems to me that this is, in reality, simply a storm in a teacup stirred up by those with vested interest in ‘sticking it to the man’ at every chance they get. 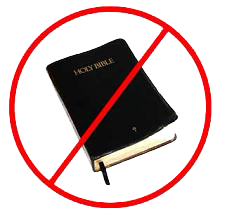 SkyCity isn’t banning Ms. Parata from bringing the bible to work and reading it during her breaks, SkyCity isn’t saying that she must choose between her faith and her job, SkyCity isn’t saying that the bible, in and of itself is the issue. SkyCity is, however badly, simply enforcing a standing policy in regards to staff uniforms, something they shouldn’t be made out to be anti-faith or anti-Christian for doing.